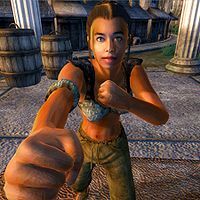 Branwen is a Redguard monk living in the southeast part of the Arena District. She is training with Saliith to become a combatant in the Arena. Her day begins at 5am when she wakes and eats a brief meal until 6am. From then until 1am the next morning she will spar with Saliith before grabbing just four hours of sleep on the easternmost of the two mats. If Saliith is dead when Branwen is due to start sparring, she will instead stand aimlessly by the bench where she eats breakfast. Whenever you try to talk to her, she responds "Sorry, friend, no time to talk! My friend Saliith and I are training to be combatants in the Arena! It takes a lot of dedication to do what we do. ", after which the conversation ends. Branwen's clothing consists of a pair of sack cloth pants, a huntsman vest and some sack cloth sandals. She also carries a carrot that respawns, and the key to the chest by her sleeping mat. The chest contains Song Of Hrormir, a Blade skill book, and the Bands of Kwang Lao, a unique pair of leather bracers that add 20 points to your Hand to Hand skill. If you watch Branwen and Saliith spar for a while, you will get a free +5 boost to your Hand to Hand skill. If Saliith dies, Branwen will continue fighting, and your Hand to Hand skill still increases. According to a crumpled note in the Arena Bloodworks, Branwen is Owyn's illegitimate daughter. However, neither Owyn nor Branwen will talk to you about the subject. This page was last modified on 28 December 2018, at 03:52.